One of the things I did a lot of in my college and graduate school years was aphid trapping with what are commonly called yellow pan traps, but are also known as Moericke pan traps. Basically, such a trap can be any bright yellow vessel that holds water and has a wide opening on top. The yellow color attracts flying aphids, who then mistakenly alight on the water and get trapped in it. The aphidologist comes by periodically to collect the aphids from the water, perform basic trap maintenance, and to refill the water. Trapping aphids in this way is useful to monitor when each species in the area is migrating between hosts, when crop aphids are immigrating or emigrating, etc. Yellow traps are also useful to natural historians, like me, for detecting rare or hard-to-find species in the environment. In all the yellow pan trapping I did, I developed some strong opinions about how they should be managed, samples collected, etc. In this article, I’ll cover some of those details. The Vessel. As noted, almost any water-holding vessel can be used, either inherently yellow, or painted yellow. Some folks use small picnic bowls, or even yellow-coated petri dishes. However, in all the places I’ve lived, very small containers like these will not work due to one or both of these factors: dry weather and irrigation. Obviously, in order for the water to trap the aphids, there needs to be water in the trap. In the arid climates of the western U.S., even a single day of hot summer weather is enough to dry up a picnic bowl of water. Similarly, if rain or irrigation is expected to hit the trap, it must have enough capacity and be carefully managed so that it does not overflow. In contrast, some folks use 5-gallon buckets. I discourage this practice as well, for a few related reasons. First, 5 gallons (~19 liters) is a lot of water to have to carry or convey to the trap each week for refilling. My new yellow pail from True Value Hardware, June 2017. This fact makes it tempting to only partly fill the bucket, with perhaps 1 gallon at the bottom. 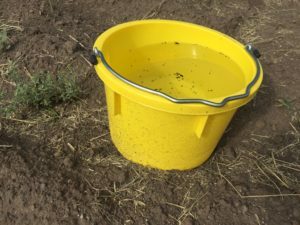 This practice will severely reduce the number of aphids captured, since the aphids are unlikely to fly so far down into the bucket to contact the water. (See below for my opinion about how full a trap should be.) The vessel I used in college, which was a very handy design, was a 5-quart pail, about 9 inches in diameter. This pail was easy to manage in terms of water volume needed, plus avoiding drying out, ease of cleaning, etc. Finding a yellow one is the only trick! Pictured here is a 2-gallon pail purchased from my local True Value Hardware store. This pail comes in a few bright colors, presumably to make it harder to lose on your farm or ranch. I have used it now for two weeks of sampling and it is very effective. Water level. As noted above, water level in a yellow pan trap is crucial. In a perfect world, the water level would be just short of flush with the rim of the vessel at all times. In the real world, your goal is to consider heat, drying, irrigation, and rain to get as close to this ideal as possible. For example, in a place where summer rain is basically non-existent, and a trap will be checked once a week, a 2-gallon bucket would have to be filled to the rim each week. In fact, in very hot and dry weather, checking traps more than once a week may be the only way to gather decent data. What to put in the water. Two things are often added to the water in yellow pan traps. First, a drop or two of soap, such as dish washing liquid. This tends to weaken the surface tension of the water, theoretically making the water trappier. I conducted plenty of successful yellow trapping, however, without using soap. One advantage of not using soap is that the trapped aphids will float on the surface for quite some time, barring rain or irrigation, making them much easier to pick out with a brush (see below for advice on gathering the aphids from the trap). The disadvantages of not using soap are that the aphids can escape more easily (I’ve witnessed this happening — they can walk on water), and the water tension is really strong when you poke your alcohol-moistened brush into the water, which causes everything to scoot away from the alcohol-water interaction on the surface. Second, I used to use a small crystal of copper sulfate in each pail each week. This inhibits mold growth on your precious aphids as they wait for you to collect them from the water. That said, if you collect your aphids from the water every couple days, copper sulfate is not needed. Placing the trap. Back in my yellow trapping days I conducted an experiment over several weeks in which my yellow traps were placed on various backgrounds. I painted sheets of plywood different colors, like black, green, etc. and compared trap catches on those backgrounds to traps placed on bare ground. I gave the data to my boss, but alas, did not keep it for myself, so I don’t recall the results in detail (I think results from similar work have been published by others). One thing I do remember is that background type strongly affected trap catch. And, I recall that traps placed on bare ground worked very well. 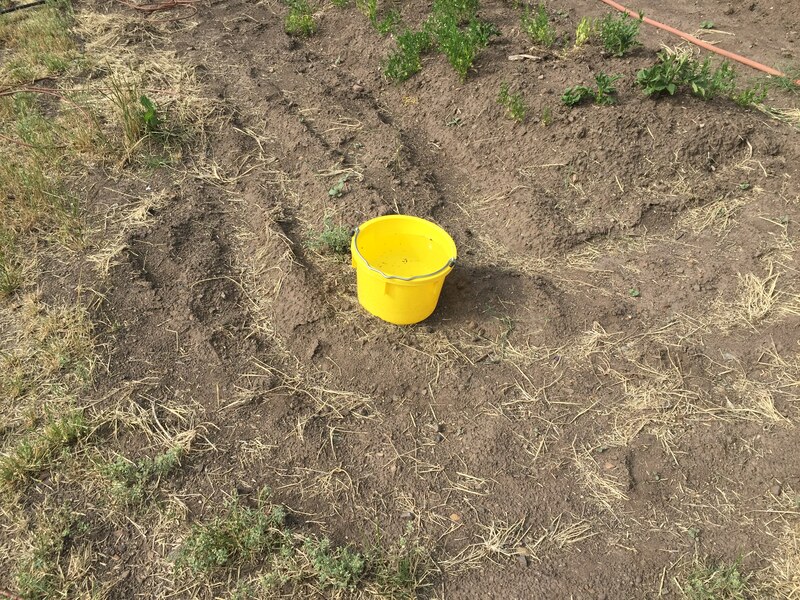 So, if using a pail or similar vessel, as I suggest, I strongly recommend placing the trap on bare ground or on a surface such as unpainted plywood (see the photo above — this trap is placed next to my garden plots on ground I till regularly). If the study is in agriculture, the trap should be placed either just outside the field, or on bare ground (or plywood) inside the field. Traps placed directly within foliage of the crop or surrounding vegetation are unlikely to be as effective. Maintenance. I’ve already talked about maintaining trap water level, and it cannot be overemphasized. Also crucial, and hopefully obvious, is that the yellow trap must be, well, yellow. For example, a yellow pail covered in dirt is no longer yellow from the perspective of an aphid. My yellow pail starting to accumulate dirt from irrigation and rain splash. Hence, at every maintenance interval, e.g. weekly, the trap must be thoroughly scrubbed outside and inside to make it as like-new as possible. Similarly, long-term exposure to sun will likely make your yellow become less yellow. At best, this makes the trap catches at different times less comparable, at worst it makes the trap ineffective. So, if using an inherently yellow thing, like a pail made of yellow plastic, change the pail at least annually. If using paint to make your color, probably painting annually is necessary. But, remember the goal is to maintain a bright yellow color regardless of effort it takes. Gathering the aphids. Not only have I done lots of yellow trapping, but as I recall it was the first task I did on my first day of work on the research farm in about 1987. I went out with the extension agent and helped him gather the aphids and maintain the traps on his 36-trap route. That was the day I learned the most elegant way to gather the aphids from a yellow trap. First, buy a handful of small paint brushes at an art supply store. By small, I mean brushes about 4 mm across. 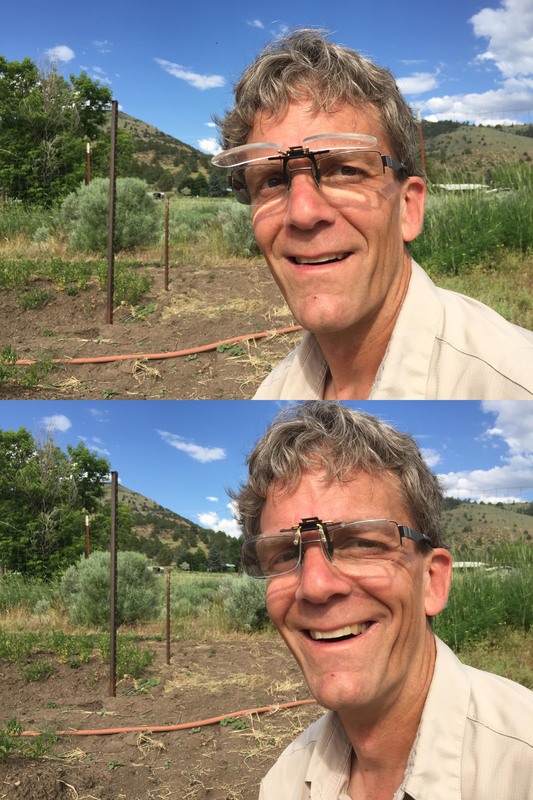 My old-man-clip-on-high-power-reading-glasses. When I was 20, I could do this work with my bare eyes. And you’ll need a handful because inevitably you’ll lose them regularly. Then, with either young powerful eyes, or if you’re old like me, with strong reading glasses on, pick the aphids from the water surface with the brush, and place them directly into your sample vial (I recommend vials of about 4 ml with flat bottoms and good quality screw-on caps, filled mostly full with 70-80% ethanol). My vial of choice, with a typical brush. Obviously, this requires the ability to recognize aphids from among the many insects in the water. It’s not as hard as it sounds – I trained talented teenagers to do it fairly quickly. Once all aphids on the surface are gathered, then start gently pouring the water out, being careful not to stir up the insects that have sunk to the bottom. 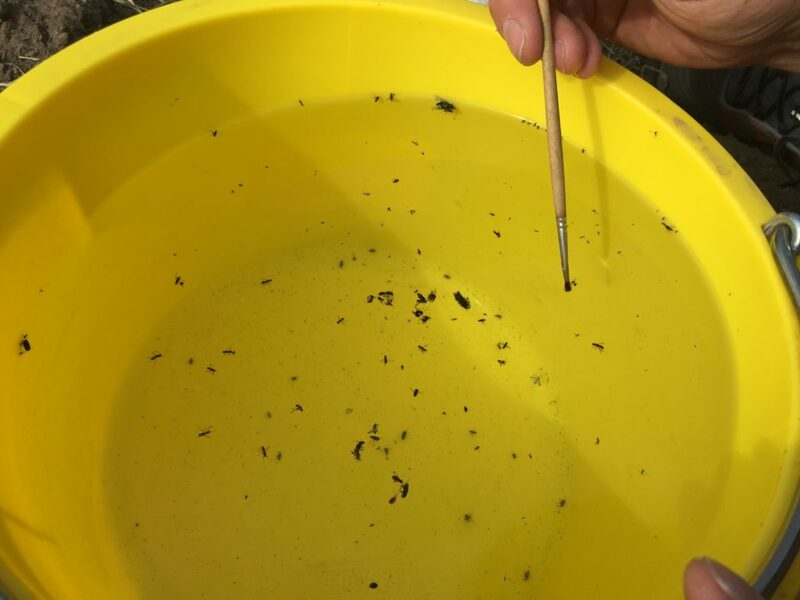 Once most of the water is poured out, start poking through the submerged insects with your brush, gathering the aphids. This is also not as hard as it sounds, nor is it overly time-consuming. Many folks will gravitate toward some kind of sieving technique for gathering the insects from the trap. An example procedure I’ve heard is to take the whole pail of water and submerged insects and pour it through a sieve. Insects in the trap, only some of which are aphids. Teaching how to choose the aphids is beyond the scope of this article. Write me, or come visit, and I can help. 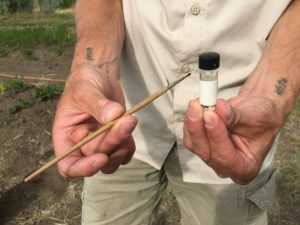 Then, gather all the insects into a large sample bottle. Then, carry that bottle back to the lab where a hapless student is assigned to sort the aphids from among all the other rotting insects, finally thereby creating a clean vial of aphids. Apart from the added steps, the sieving technique suffers another serious drawback: physical damage to the insects so processed. Correctly identifying aphids requires that they arrive at the aphidologist’s desk with their legs, antennae, wings, abdomens, and heads attached.